India's Middle Class Gets Brand-Name Health Care Medicine is changing around the world as incomes and expectations rise. Leading U.S. institutions, like Harvard, are at the forefront of a global health care movement, striking up partnerships overseas. Around the world, people are traveling far from their homelands to seek out affordable health care. Harvard is one of about a half dozen leading U.S. medical institutions forming health care partnerships with other countries. Officials of Wockhardt Hospitals, a Harvard-affiliated for-profit chain in India, stand in front of a new facility in Bangalore, a center of high-tech business. Medicine is changing around the world as incomes and expectations rise. And big-name American institutions are out there at the forefront of change. Take the Cleveland Clinic, one of the top brand names in American medicine. It has partnered with the government of Abu Dhabi to build a deluxe new teaching hospital on the Persian Gulf — at the Arabian government's expense. "The Cleveland Clinic/Abu Dhabi will contain our ... cultural DNA," Cleveland Clinic chief executive Toby Cosgrove declared last year when he announced the venture. "It will bear our name, our imprimatur of medical excellence." Practically all the big names in U.S. medicine are out there propagating their institutional DNA. In Dubai, Singapore, Thailand, Turkey and China, you'll see names like Johns Hopkins, Mayo, Duke and Cornell. Drive down Bannerghatta Road in Bangalore — the heart of India's Silicon Valley — and you'll see the phenomenon writ large. Among the glass towers bearing names such as Samsung, Motorola and Global Edge are new hospitals affiliated with Baltimore's Johns Hopkins and Tufts University Medical School in Boston. Down the street looms the new, granite-clad facade of the Wockhardt Hospital — part of a fast-growing chain of for-profit hospitals. 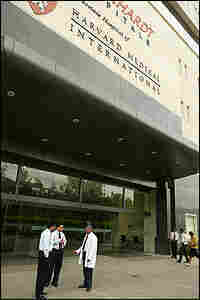 Underneath the Wockhardt name, in letters just as big, it says "Harvard Medical International." Vishal Bali, CEO of the Wockhardt Hospitals Group, says his company — far from the largest Indian hospital chain, but with big ambitions — formed an alliance with Harvard because "we felt what we needed was a partner who would hand-hold us into getting the best practices from the American heath care system." The chief hand-holder is 8,000 miles away in Boston. Dr. Robert Crone, president and CEO of Harvard Medical International, says he wants to lift medical care around the world to Harvard's standards. "We don't think twice about the fact that, no matter where a 747 made in the United States flies, anywhere in the world, the standards are the same," Crone says. "Why doesn't that happen in medicine? Well, it's beginning to happen. It's going to take another decade or more. But we have to stop thinking so provincially about health care." Crone says it's in Harvard's interest to go international. "It's not good enough any more to be the greatest name in American medicine," he says. "If one is truly going to be a global leader, [you] have to try to figure out how to work globally." Working globally means, first of all, helping foreign health care executives design hospitals to the highest standards — with state-of-the-art operating rooms and intensive care units and amenities such as marble-floored lobbies and plush waiting rooms. "We have computerized tomography, we have MRI, we have mammography," says Dr. Lloyd Nazareth, Wockhardt's quality-control chief, as he gives visitors a tour of the nine-month-old Bangalore hospital. The hospital is designed to appeal to middle-class consumers with choices. The rooms are large, bright and clean. And there are plenty of nurses. It's a world away from the crumbling public hospital across town, where 40 beds are squeezed into a ward served by a single nurse. Nazareth proudly shows off Wockhardt's maternity unit, which has five grades of rooms. "The sign says it's not a spa, it's not a five-star hotel," he says. "It's an exclusive birthing suite." Nearly everybody who comes through Wockhardt Hospital's heavy glass doors can afford it. That's because India's economy is booming — nowhere faster than in bustling Bangalore. About one in 20 Wockhardt patients comes from America or Britain for hip and knee replacements and heart surgery. But the vast majority of Wockhardt's customers aren't medical tourists. They work in Bangalore's famous call centers — fielding customer service queries all night from America — or writing software. Most of those jobs come with health insurance — in a country where only 10 percent have it. At Wockhardt, patients who don't have total coverage have the cash to pay for their care. They're patients like Shankar Murthy, a 65-year-old man who came to Wockhardt for coronary artery bypass surgery. At 180,000 rupees, he says it was a bargain — the equivalent of $4,500. 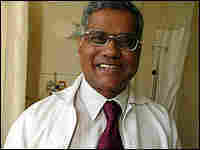 Murthy has heard that in America the same operation would cost at least $50,000. "We are spending 10 percent," he beams, sitting on the side of his hospital bed. "What would have been done there, we get done here." Price is important to Murthy. He's not super-rich. He's a retired dairy consultant. Most of his surgery will be paid for by insurance, through his son, a software engineer. For many high-tech Indian workers, insurance covers dependent parents as well as children. But Murthy will pay $1,500 out of his own pocket. That's not peanuts in India, but for a middle-class Indian it's not a fortune either. Harvard is one reason Murthy came to Wockhardt. He's heard about Harvard University. "We have heard that Harvard University is the best university in the world," Murthy says. That gave him more confidence that his heart surgery would be first-rate. To keep those kinds of patients coming, Nazareth says the company is pushing quality. "Quality is a strategic business initiative," Nazareth says crisply. "Quality never costs money. It actually brings more customers to you. So our philosophy ... is that quality does not come at a cost. Quality is free." That doesn't mean it comes easy. Wockhardt works at things like preventing surgical mistakes, medication errors and drug-resistant infections — with help from its partners in Boston. Once a week, the Wockhardt leadership teams huddles around a speakerphone in Nazareth's windowless basement office and dials up Harvard to go over the nuts and bolts of running a hospital. Right now, Harvard experts are helping their Bangalore partners get ready for a crucial inspection by the Joint Commission International, a U.S.-based organization that is the hospital world's Good Housekeeping Seal of Approval. It's obvious what Wockhardt gets out of Harvard. It's less obvious what Harvard gets out of the deal. So far the money isn't fabulous. Harvard Medical International generates a bit more than $20 million a year out of all its partnerships in a dozen countries. After expenses, it turns over a couple of million dollars to Harvard Medical School. Other U.S. hospitals and medical schools reportedly command up to $20 million for licensing their names to foreign affiliates. The potential value of these foreign ventures is more uncertain. But Wockhardt CEO Vishal Bali says it's important for institutions like Harvard to be involved in India, China, the Middle East and Southeast Asia. "This is truly about globalization of medicine and health care," Bali says. "All the leading players of the world are now looking at being physically present in various parts of the world and being part of the evolution of the global health care system." Ultimately, that will improve care to millions of people around the world — or at least those who can afford Western-style care. But that's in the future. For now, there's debate within Harvard about lending its good name to institutions halfway around the world that it doesn't control. 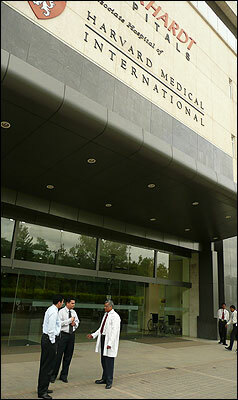 Insiders say one way or the other, Harvard will stay involved in India, in Dubai and in other medical outposts. That's partly for the same reason Harvard's peers are out there — the fear they'll be left behind if they don't go international.